Thanks to you and others around the country, Frances is a finalist to become American Hero Dog of the Year. Recently, I shared a post about Guide Dog Frances being a semi-finalist in the National Hero Dog Award Contest. I was thrilled to publish an article to raise awareness of the importance of Frances’ role in her handler’s life. And now, thanks in part to you, Frances is a finalist who could become the 2018 American Hero Dog of the Year. Congratulations to Holly Bonner (Blind Motherhood) and her guide dog, Frances, of Staten Island, New York. Frances won the distinction of being the nation’s Top Guide/Hearing Dog of the year. The pair is one of seven remarkable canines who are finalists in the 2018 American Humane Hero Dog Awards®. The awards gala, sponsored by the Lois Pope LIFE Foundation and Zoetis Petcare, will broadcast as a two-hour special on Hallmark Channel this fall. Holly and Frances are being recognized for their advocacy work on behalf of blind parents across the nation. This dynamic duo now needs our help! Vote for them 1 time per day until September 5th, 2018. Click the link below to cast your vote! All you need to do is enter your email address and zip code. Franny is sitting looking directly at the camera with her deep soulful eyes. She has the sweetest face and her eyes seem all-knowing. A pink decorative necklace with colorful pompoms is around her neck. 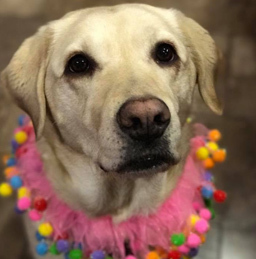 To win the NATIONAL TITLE OF HERO DOG For The US – we need to vote for Frances once a day from now until September 5th. Who doesn’t love a hero? And who can deny there’s something extra special about the heroics of a furry companion? A courageous cancer battle, then later sight loss from her treatments, threatened to turn Holly Bonner’s life upside down. As a mom with two small children regaining her independence came in the form of a canine hero. From the moment Frances, or “Franny” as she’s affectionately known, met Holly life hasn’t been the same. So when I found out Franny was a semi-finalist in the National Hero Dog Award Contest I wanted to share her story. As a dog-lover myself I can appreciate the effect a dog has on the life of its owner. In Franny and Holly’s situation though I noticed a remarkable difference Franny made in Holly. Franny gave Holly a priceless gift—independence. To be clear, Holly was independent before Franny. The noticeable difference was in Holly’s confidence. Never one to skip an advocacy opportunity Franny has become Holly’s four-legged partner. Franny and Holly came together in September 2016. A female, yellow Labrador retriever, Franny is a certified “guide dog,” trained by Guiding Eyes for the Blind. Her training specifically included intense socialization around children and she now works with Holly in a variety of educational settings. She possesses exemplary self-control and obedience skills. Franny’s partnership with The Visually Impaired Education Program (V.I.E.P.) is an original program Holly created to help educate the Staten Island Community. The V.I.E.P. provides an opportunity for kids (Pre-K to 8) to learn how to positively and respectfully interact with the blind and visually impaired community. Here is a link to learn more about V.I.E.P. Receiving this HERO DOG AWARD would shed a national light on how guide dogs help blind parents raise families. Additionally, Guiding Eyes for the Blind would receive a monetary prize, allowing other blind individuals to benefit from a guide dog. Please vote for Frances EVERY DAY at herodogawards.org/dog/frances from now until July 11th, 2018. Image 1: Holly sits with Frances at her feet, surrounded by Cub Scouts from Troop 6 in Staten Island. Image 2: Teal circular logo, with the letters “V.I.E.P.” at the top. A caricature of Holly and Franny (sitting to the left of Holly). Franny is wearing a leather harness with “guiding eyes” on it. Holly smiles with a short bob haircut and dark glasses. She’s wearing a Cabernet colored shirt with a blue and gold-toned scarf. In her right hand, she is holding her white cane.